Hyperbole is Hilarity: Charlie and the Chocolate Factory – The Bookshelf of Emily J.
I thoroughly enjoyed reading Charlie and the Chocolate Factory (1964) by Roald Dahl. It is number 99 on the BBC book list. Dahl is one of my favorite children’s authors. His style is goofy, creepy, funny, and enthralling. I remember reading The Witches as a child and just being enchanted and frightened out of my wits at the same time. And of course, I read many more of his books as well. I also used to watch the movie version, Willy Wonka and the Chocolate Factory, starring Gene Wilder. As I read the book, I had the film’s songs running through my head (along with childhood memories of watching the movie), and I was impressed at how well the movie followed the book, although it was not as funny as the book is, at least to my memory. I have not seen the more recent film version with Johnny Depp. Should I? Is it good? The book was funnier because of the little details and descriptions of the family. Charlie’s dad has a job in a factory where he screws on toothpaste caps for a living. Charlie’s grandparents are bedridden and have been for twenty years. They also have matching names: Grandpa Joe and Grandma Josephine, and Grandpa George and Grandma Georgina. Additionally, Dahl describes the many types of candy and chocolate both in the factory and on the shelves of the stores. It’s delightful to read these imaginative descriptions. The book struck me as two things: a warning against gluttony (in many forms) and a children’s version of Agatha Christie’s And Then There Were None. Gluttony is addressed through the personalities of the children with golden tickets who are then admitted into Mr. Wonka’s factory for a tour. Augustus Gloop eats too much and is chubby. Violet Beauregarde chews gum all the time and indulges in that nasty habit more than is necessary (or sanitary). Veruca Salt wants everything and has never been told no. Anything she sees, her parents buy for her. Mike Teavee watches television all of the time, as his name suggests. He cannot stop. (He reminds me of my three-year-old.) All of these children are overindulgent and have overindulged. Charlie Bucket is the only one who has gone without, eating cabbage soup for nearly every meal. He comes from a poor but happy family, and he has learned the value of hard work and of sacrifice. To him, one chocolate bar a year is a luxury. The other children are foils to Charlie’s goodness, and they are extreme examples of gluttony. There are also some lessons in parenting and the value of saying no hidden in the book’s exaggerated situations. As to Agatha Christie, the story slowly sees the children disappearing. Augustus falls into the chocolate river and is sucked up a pipe. Violet turns into a blueberry and is rolled away. Veruca is attacked by squirrels and thrown down the “bad nut” shoot. Finally, Mike is shrunken into a television character. They all are slowly knocked out of the “competition” in the chocolate factory because of their own vices. (Sounds a lot like life, if you ask me.) Charlie remains the only child with self control, and he finds himself rewarded with being the heir to the factory. It is quite a fantastic and magical story that I can’t imagine any child (or adult) not liking. Hyperbole is the stuff of hilarity. One of my favorite books. Have you read his biography? No, but I SHOULD! Right? I would probably love it. If you like Tim Burton movies, then by all means see the new movie. However, as much as I like Tim Burton, I still prefer the Gene Wilder 1971 film. Neither Depp nor Wilder is quite as animated a “sprite” as I imagined Wonka to be from reading the book, though. Good point. Neither movie will do justice to Dahl’s character and the experience of reading the book and experiencing the character for oneself. Great review! For what it’s worth, the Tim Burton/Johnny Depp film is excellent. What really makes it work is that Depp didn’t fall into the trap of emulating Gene Wilder (because, really, no one can). He really makes the part his own and is a lot of fun to watch. Not gonna lie, though. I thought CHARLIE AND THE GREAT GLASS ELEVATOR was terrible. Despite how much I loved the original, I couldn’t get past the first few chapters of the sequel. Well, that doesn’t make me want to read the sequel! Maybe that is partly why I never have… Maybe most would agree it isn’t as good. I can imagine it would be hard to be Dahl and have to top yourself with every new book. They are all so great! Nice, Emily. It does sound like life. I have not read the book and no matter how many times, I’ve been in the room while the Gene Wilder movie was being played, I could not watch for very long. I do not think I’ve seen it all the way through. It always felt a little creepy. Somewhat of a diversion, if you like Gene Wilder, you may want to take a look at his book, “Kiss Me Like a Stranger.” I listened to him read it on an “audiobook” on a road trip a few years ago. He read out loud well, as we might expect from an accomplished actor. It made the trip short. It is a little creepy, but the book isn’t! And that book by Wilder sounds interesting. I may give it a try when I start commuting to school again in the fall. The Gene Wilder and Johnny Depp films are two different beasts and satisfy two different groups of people. The Wilder film is 1960s, multicoloured, musical with Wilder being a joyful child at heart. The Depp movie is very monochromatic, much darker, no songs, and Willy Wonka is a damaged, insecure child at heart. With a weird haircut. The children are as naughty was each other, but the Depp movie is a….little more threatening. Veruika and the squirrels anyone? Weird haircut! Ha! Well now I really want to see it. Thanks for the thorough description/comparison. I personally prefer the Tim Burton because, despite a few Burtonesque quirks, I think it is truer to the story and spirit of the original book. I read the book several times as a kid, and always tried to sing the Oompa Loompa’s songs as each diabolical child is sucked away. Ah, good to know. I like hearing your perspective on the Burton version. I think reading all of the comments and opinions on it makes me want to see it. I wonder where I will fall in liking or not liking it. ok, I’ll give you that. It’s just that one of the abiding memories of the Wilder one is the songs, whereas with the Depp one, I can hardly remember a single one. LOL. Way to look on the bright side. Yes, movies can’t do justice to the books. I love this book and I love both movies also, for different reasons. Gene Wilder is definitely more fun and spritely while Johnny Depp is Deppishly (deliciously) creepy and the mood is much darker. Neither movie holds a candle to the book though, Roald Dahl (love his name!) is a great writer. I like all the creepiness masked by humor. The BFG is a favorite. Also James & the Giant Peach. Also… well, most of his children’s books are favorites. I have not read any of his books for adults but I think I should check them out. Thanks for this fun post and for reminding me about Roald Dahl. He is a great author. A few years ago my daughter and I read The Twits, one I hadn’t gotten to as a child. It is hilarious. We also like Matilda. You just can’t go wrong with him (and his name is awesome. I agree with that!). Thanks for the recommendation. I don’t know how I’d made it through childhood and now my own child’s without having read his books (! ), but now I feel excited to put them on our to-read list. Our generation of kids have so many of their own authors and books that it’s nice to (re)visit the classics sometimes. Yes, read him! You and your son will love it. Dahl should not be missed. I loved the original version of the film, I was not that carried away by the Depp version. Though it wasn’t bad, it just didn’t out shine the original film. I can’t wait to read the book. I’ve loved the film version of Dahl’s books but I haven’t read them. Or perhaps briefly as a child. Do read them! You are in for a treat. I still think The Witches is my favorite of his books. Love Roald Dahl! My favorites are Matilda and Fantastic Mr. Fox. I don’t remember how old I was when my parents read them to me, though. Do you have a sense of what age group would be most appropriate for Charlie & The Chocolate Factory? Hmmm. Good question. My eight-year-old read it and liked it. She enjoyed his book The Twits a few years ago. I bet Barnes and Noble has it categorized by age on their website, but I would say, any reading age, young and old! I think eight sounds right! I know my mom read Fantastic Mr. Fox to me and my brother and sister, so I think we must have ranged in age from 4ish to 9ish. We bought our son all these great children’s books (Charlotte’s Web!) when I was pregnant, and didn’t really think it through — it’ll be another four or five years before he’s ready for them! I love it! I used to buy books for my children before I even had them. Every good home library needs children’s books! Roald Dahl is fantastic, and his children’s books are timeless. His adult stories get overlooked but are very good as well. Quentin Blake, though has a big say in the imagery and appeal of his books. It’s one of the greatest author-illustrator combinations, like Tolkien-Lee, or Dore with Blake and Dante. I love Charlie and the Chocolate Factory because, apart from everything else, I’ve always loved those stories that follow a group of disparate characters on a quest through a magical land, where the story is framed with obstacles that bring their different strengths and weaknesses to the fore and ensure their survival or downfall. As a young child it was Wizard of Oz and Charlie and the Chocolate Factory, as an older child it was The Odyssey and as a teenager it was… Jurassic Park! Nice interpretation! Even Charlie is a sort of hero on a quest, like so many of our popular stories. And you’re right about Quentin Blake. One of my favorite illustrators is Garth Williams, with both E. B. White and Laura Ingalls Wilder. The two, author and illustrator, go together for sure. Dahl is highly regarded in this household! My son has read everything multiple times and we’ve done lots of read-alouds. I also really enjoy teaching his books — they are so accessible to kids and contain a great deal of food for thought for adults as well. I love how he really is able to get inside the mind of a child and write truly from their perspective. Favorites are Matilda and George’s Marvelous Medicine, but we love them all. Thanks for a great post, Emily! That’s true. I think it is usually worth it to go back and read children’s books as an adult. They are so fun and timeless and bring back good memories. I think the movie will be added to my Netflix queue shortly! I recently took the plunge and bought a Kindle. I’ve loaded it up with a few of my favorite authors from when I was a kid- including Roald Dahl. I can’t wait to re-discover the books that set my imagination on fire as a child. 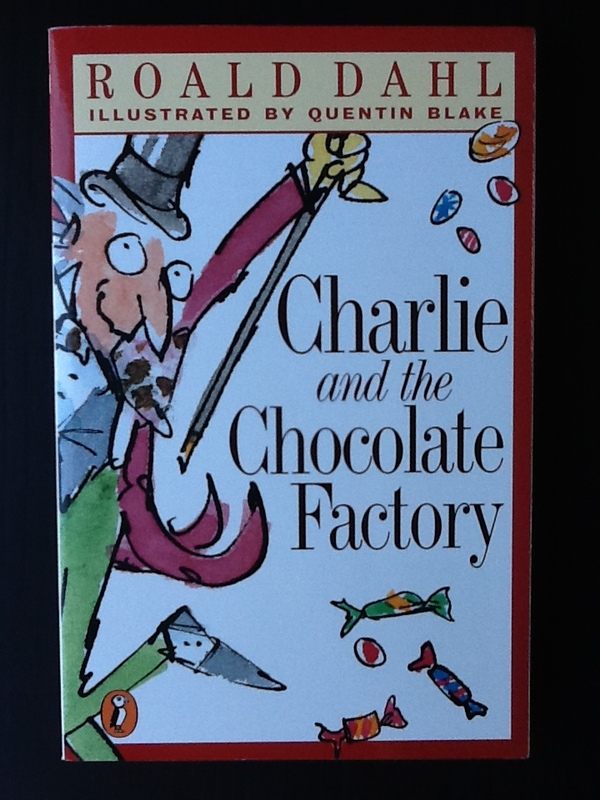 This post definitely has moved Charlie and the Chocolate Factory to the top of my “To Read” pile! Yay! I hope you love the kid books as much now as you did then. And how fun that you got a Kindle. I tried ebooks on my ipad, but I just prefer plain old-fashioned printed copies. I preferred the Gene Wilder version over the Johnny Depp one, but that might have more to do with me having a man crush on Wilder, specifically when it comes to his “mood hair” (you can always tell how angry he is by the height of his hair, especially at the end when he yells at Charlie – his hair becomes massive. There was actually an interview, I think it was on the DVD where Wilder says that he pulled the kid that played Charlie aside before that scene and said, “Now, I’m going to have to yell at you now. I don’t want you to be scared. It’s just pretend…” or something along those lines). Whenever I watch it now, though, I skip to the second half when he shows up. I had seen enough of the poor, bleak European city over the years. 1. Grandpa Joe has been bedridden for 20 years, depending on Charlie’s parents to see to his every need, but when a golden ticket is introduced and they start talking about a day long, walking tour through a chocolate factory, suddenly Grandpa Joe isn’t quite the invalid. Sure, he spends a minute on shaky legs when he steps out of bed, but after that he’s dancing around, and at no point during the tour did he need to lie down for another 20 YEARS because he was too weak to go on. So it stands to reason that if he were able to endure the walking tour, he was probably healthy enough to have gotten some sort of job – not physical labor, mind you… but he definitely could have worked in a shop, instead of leeching off his family for two decades. When you think about it, maybe they wouldn’t have had to eat cabbage soup every night and only have chocolate once a year if he had actually contributed a paycheck. 2. Fizzy Lifting Drinks. Everyone knows this quite well. Charlie just wants to keep his head down, not become victim to an oddly metaphorical almost demise like the rest of the kids, but Grandpa Joe says, “Never mind those other kids that almost died, Charlie…let’s hang back and drink something that’s supposed to make you float, but hasn’t been tested properly, to the point that the guy who runs the entire factory says, ‘Hey, guys, this isn’t ready.’ . Better yet, let’s do it in a room with nothing to hold onto, with a ceiling of massive fan blades. That’s a role model for you right there. I’m surprised that after the tour he didn’t take Charlie out for a whiskey. Anyway…I haven’t read the book but always wanted to. Good to hear that it’s fairly well received. I love your comment! Yes, of course Grandpa Joe is the villain! What a great interpretation of the movie. I kind of want to watch it again just to see Gene Wilder’s hair grow, and how cool that he took the kid aside to warn him that he would yell. So your comment also reminded me that the movie is different from the book in that Charlie and Grandpa Joe don’t hang back and drink the stuff they aren’t supposed to. In the end, Charlie is the only “good” kid and he inherits the factory. I wonder why the movie version changed that? Do read the book! If you know and remember that much about the movie, you will likely very much enjoy the book. Thanks for adding this fantastic information to the conversation. I’m definitely adding it to my “to read” list on Goodreads. You should see the new film but I personally prefer the older version. I think I will. I want to know now which one I prefer. You are right! I should. And isn’t it funny how the movies versions just never tend to live up to the books? I think Dahl’s books lend themselves well to film adaptations, but yes, nothing can top the books! I haven’t read the book yet, but I will certainly do, considering the great success that the movie has on my big familly. We just can’t get enough of watching the newest version of the film again again with my three daughters and I must find the book translated into greek for my oldest daughter to read. As far as the movie is concerned, it has given us the opportunity to enjoy long conversations and wise messages are underlined every time we watch it. How true! Even though this one is funny, there are some wise words and truths “hidden” in the text. Thank you for your insight on the book, through this blog post I revived my memory of the book. The thoughts on gluttony was a nice observation and yes I would recommend the Johny Depp version of the movie. The type of hilarity you dug out from the book is manifested in Johny Depp’s acting! I particularly liked the part where the great chocolate factory owner is, ironically, a dentist’s son! So in that way I can also see the balance that Roald Dahl maintained in his book between parental control and child rebellion! If Mr. Wonka had given up his dreams and imagination, he might not have achieved the greatness and fame through his passion. Whereas if there was significant control of the parents on their respective spoiled child, who later got out of competition because of their vices, they might have inherited the Chocolate Factory! Great observations! There is certainly some irony in Wonka fulfilling his own dreams and in being the son of a dentist! I had forgotten about that. Thank you for reading and adding your insight.